On the way to the wine store? On the way home from the wine store? While perusing the wine aisles at the wine store? I guess I’m not sure exactly when or how, but I have developed a passion for white wine. And Rosé. Don’t get me wrong, there is nothing that will ever comfort me like a beautiful big bad cab with big aromas and perfectly balanced tannins. However, it seems I cannot come home from any wine store visit these days without at least one bottle of white and a bottle of Rosé. In fact, I recently ran out to buy white wine even though I had some very good red options in my cupboard. On that particular trip I came home with Rombauer Chardonnay. If I had a dime for every time I’ve witnessed someone wax poetic about Rombauer Chardonnay, I’d have ALOT of dimes. I figured if I was going to make a special trip for some white wine, I might as well splurge a little. I’m now in the Rombauer fan club. Another recent impulse purchase was a Vouvray. I believe it was off-dry, but I have a very limited frame of reference when it comes to white wine. While I do believe it had a touch of sweetness, the very high acidity made it seem very well balanced. It was like a Lay’s potato chip in that I couldn’t resist another sip even though this will probably never become a “go to” wine for me. Then there was this white Bordeaux…. If I have had a life changing wine moment to date, it would be while standing in a grocery store in Cleveland, OH. The store, Heinen’s, had a very nice selection of wines to taste in those pneumatic dispensing machines that allow you to purchase 1 oz pours so you can try a lot of wines. I tried a white Bordeaux and I loved it. Not liked, loved. It had great mouth feel and was creamy and delicious. Fruity, yet somehow buttery. It knocked my socks off. 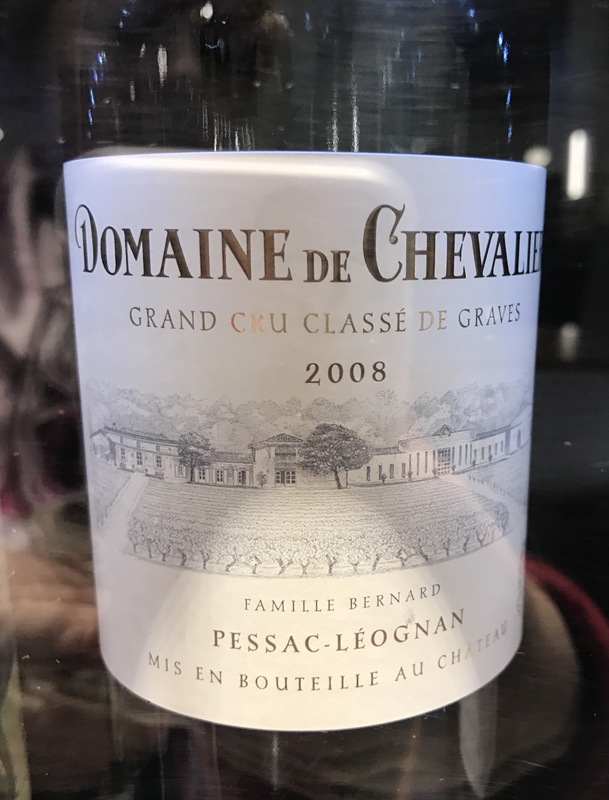 The wine was Domaine de Chavalier Pessac-Leognan Grand Cru Classe de Graves Blanc 2008. Leave it to me to have the first white wine I fall in love with be a Bordeaux that retailed for more than $100! I pretty much appreciated the moment and blocked it from conscious. I’ve been trying hard to get to know Sauvignon Blanc. I seem to gravitate to New Zealand on this which makes me really curious about California, Oregon and Loire Valley producers of Sauvignon Blancs and so anytime I see a bottle by a producer I have not tried for less than $15, it is not even a question, it is coming home with me. Rosés are an entire world unto themselves. I can’t decide if I really like Rosé for the actual taste or if I am in love with the color and appearance of the wines and therefore just biased based on appearance. There are so many beautiful shades of pink! And they look so beautiful in a glass against a blue sky or water. My most recent Rosé purchase was Notorious Pink. Notorious Pink – Please tell me why everyone thinks the French don’t have a sense of humor? This bottle is so beautiful. I love the stopper — not cork, not corkscrew — but a little glass plug. J’adore. 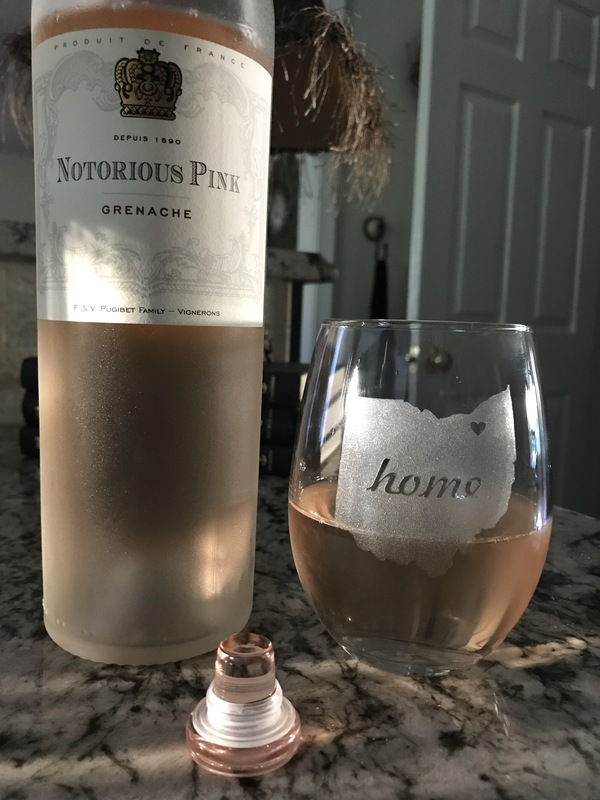 (Special shout out to my oldest daughter for my amazing Cleveland wine glass that happens to look prettiest with Rosé in it). This new found sense of adventure in wine drinking is not only fun, it’s liberating! For reasons I could not begin to explain, it feels like I’ve just died my hair a different color – or cut it off! There are over 10,000 grape varieties out there…and I’m pretty sure I’d like to try them all. Previous Post What Would Jesus Drink? Next Post Book Review: A Drinker With a Writing Problem…..
Another great post!your a poet and don’t noet ! !